Nodal Office means the offices which act as interface between the subscribers and the central recordkeeping agency and shall include the Principal Accounts Office (PrAO), Pay and Accounts Office (PAO) and Drawing & Disbursing Office (DDO) under the Central Government or analogous offices under Central Government. Obtain the duly filled Application for allotment of PRAN from the subscribers, fill and certify the employment details. Consolidate Application for allotment of PRAN and forward it to PAO. Distribution of PRAN kit, I-Pin, T-Pin to Subscribers. Forward the Switch requests, New Scheme Preference requests, Change in subscriber details request, Withdrawal Requests received from Subscribers to the PAO. Providing information to PAO about Subscribers’ pension contribution. Forward the grievance of the subscriber to the PAO. DDO shall register itself with CRA before it starts providing various services to the Subscribers. For registering itself in CRA system, DDO shall forward the applications for registration to the concerned PAO. Consolidate DDO registration form and forward it to CRA for registration. Facilitate registration of Subscribers by consolidating the Application for allotment of PRAN received from the concerned DDO and forward it to the CRA - F.C. Upload Subscriber Contribution File (SCF) to NPSCAN system. SCF will contain subscriber wise details of pension contribution such as PRAN, Pay month and year, Subscriber Contribution amount and Government Contribution amount etc. PAO will deposit the contribution amount in the Trustee Bank as per the SCF uploaded in NPSCAN. This contribution amount will be invested in various schemes of PFM, based on the Scheme Preference of Subscribers for which SCF has been uploaded. 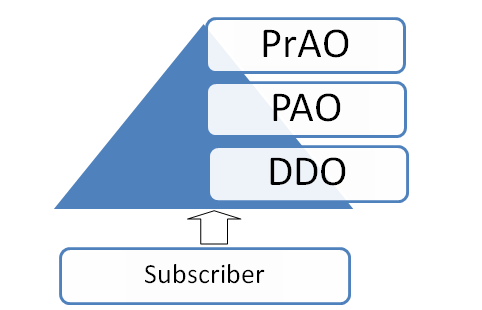 PAO will raise grievance on behalf of DDO and the subscriber. PAO will resolve the grievance raised against it by any entities in the CRA system. However, before performing the above-mentioned functions, PAO shall have to register itself with CRA. For registering itself in CRA system, PAO shall forward the applications for registration to the concerned Pr.AO. A Principal Accounts Office will have several functions in the NPS. However, most of them will be in the nature of monitoring the performances of the Nodal offices under its jurisdiction. CRA will send various alerts to Pr.AO to facilitate it to carry out the role of a supervisory entity. Pr.AO will be responsible for carrying out the following activities. Monitor performance of PAO and DDO in discharging their responsibilities in CRA system. Monitor the resolution of grievances raised against PAO. Pr.AO, in its capacity of a Nodal Office shall register itself with CRA. Further, Pr.AO will send the registration applications of the PAOs attached to it to CRA. For details of Central Government Nodal offices.